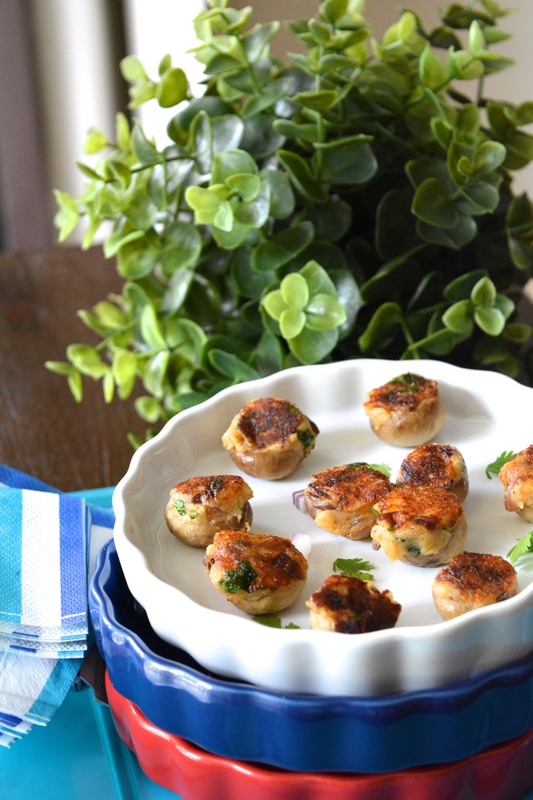 Meatless Monday Post- I got these awesome mini-button mushrooms from coles. They looked so cute-I didn’t want to chop them. So there I was, thinking what to do with them. Meanwhile, add halved potato to boiling water, add some salt, cover and cook until potatoes are well done. Grate the potato, add it to a bowl. In a pan, add coconut oil, add chopped almonds, once they turn brown, add red onions, garlic, once red onions are caramelized, add to grated potatoes, add some chili powder, coriander & mint leaves and do taste check. If you need extra salt/chili powder, add them in. Now, stuff this inside the mushroom caps and grill them on a griddle, roast on both sides on a low heat. So yummy and lovely presentation!!! Thanks Malar <3 Missed you. You disappeared 🙁 All good? 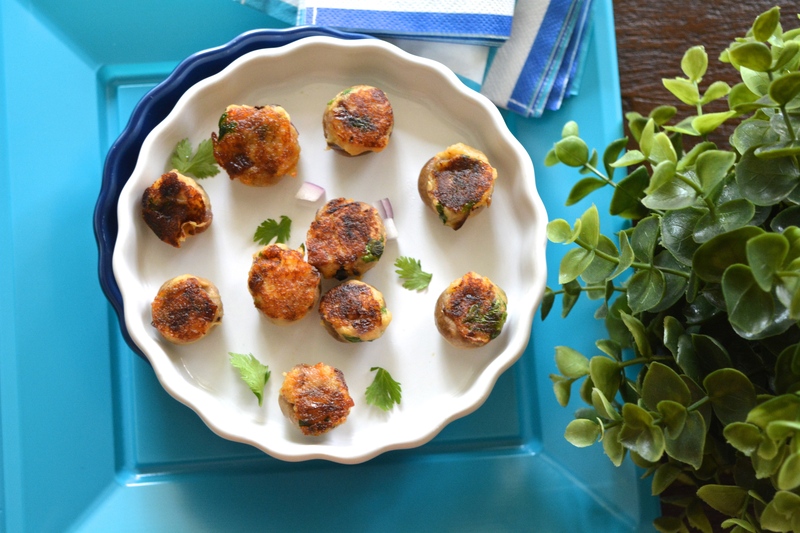 ooh nice recipe and nicer pictures! I am eyeing the curvy little plates though! Thanks Namz <3 Watch out for mini-pie pans. That's what they are. 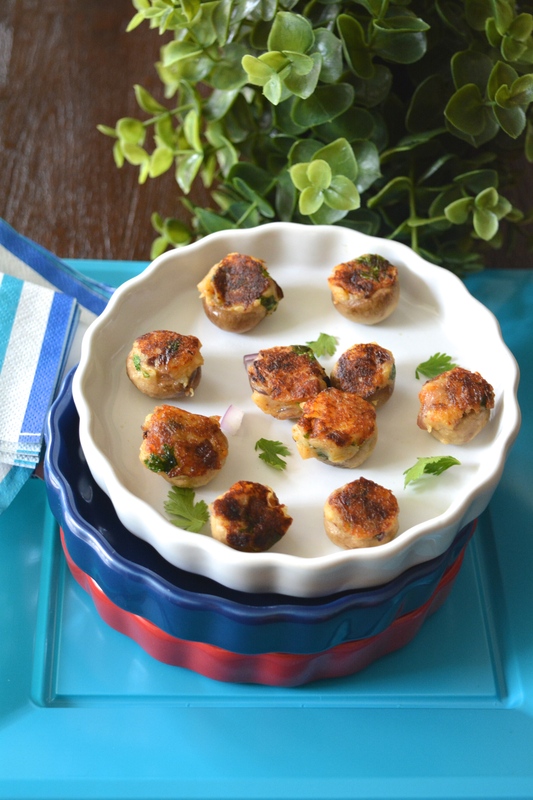 I absolutely <3 the looks of mushrooms, Charanya! Where to start? No frying…excellent! Mmm…deliciously flavored potato stuffing…yum! And guacamole too? Perfection! 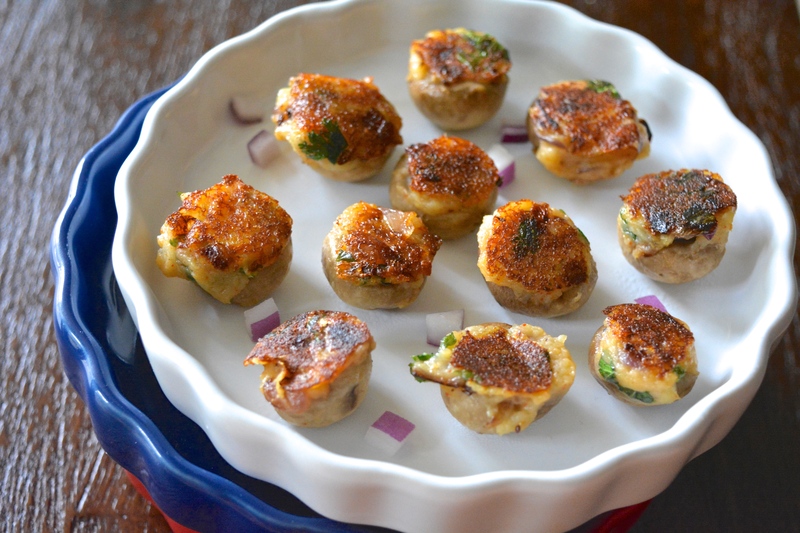 This is a fabulous recipe to make as an appetizer and I will definitely be making them soon. 🙂 Thanks for sharing your recipe at Fiesta Friday!! Oh yum. What an amazingly fantastic idea. This is definitely going on the list for summer holiday cooking (we have six weeks of school holidays over Christmas – so this one is for the teenagers to try). Happy FF. These are the perfect party food. 😀 Looks so delicious. Thanks so much for sharing this over at Healthy Vegan Fridays! I have pinned & shared your recipe.